NomadPhone – Must Have Travel Facility ! Cool feature of the app is the idea trigger, just shake your phone and a card with a picture and a set of keywords will appear on your screen. 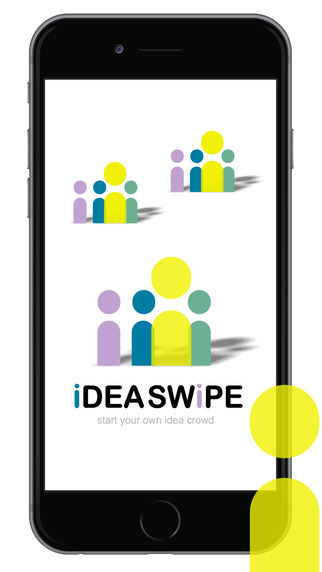 IdeaSwipe is an iOS app developed by Effective Mind AB. It is a free service that allows you to share your ideas among friends and colleagues with ease. 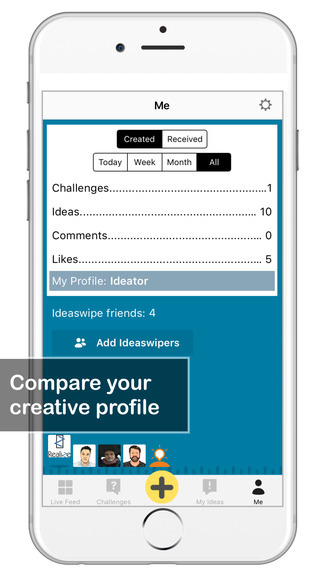 It is a productivity app that makes life simpler by helping you to capture your ideas and share them with ease. All you have to do is to capture your idea in the form of text, voice recording or image and share it with your friends. You can then get their reactions in the form of comments. The app can be downloaded for free from the App Store. When you get started with the app, you will have to register with the app. The registration process is quite simple, easy and quick. Once you register and open the app, you will be provided with a list of features to explore and use. You will then be redirected to the home screen for live feed. This is where you can track recent posts and activity from your friends. 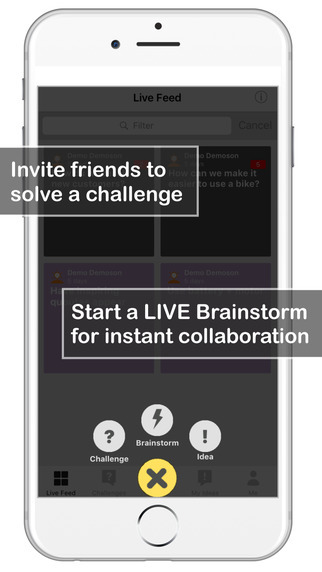 You can create a challenge and then invite friends to collaborate with you to solve it. Alternately, you can also host or join a live brainstorming sessions. These sessions are 30 minute sessions where a set of people focus on a single idea and work on developing it. You can get real time reactions and opinions of others on your idea. You can also create your own idea and check your previous ones at any given point of time. There are also options to edit previous ideas and add images. You can also change the theme color of an idea to give it a unique touch. IdeaSwipe app has a quick add button at the bottom of the screen. This button is for times when an idea is fleeting across your mind and you wish to capture it before it is lost. You can use it to create an idea, brainstorm or a challenge at any point of time. The user interface design is very simple and free from clutter. This simplicity and ease of use helps you focus on your ideas and not waste time struggling with the app itself. 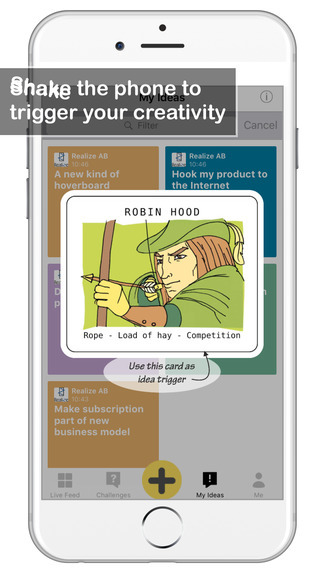 Another fabulous feature of the app is the idea trigger. You just need to shake your phone and a card with a picture and a set of keywords will appear on your screen. These can be used as stimulus or triggers to ideas. 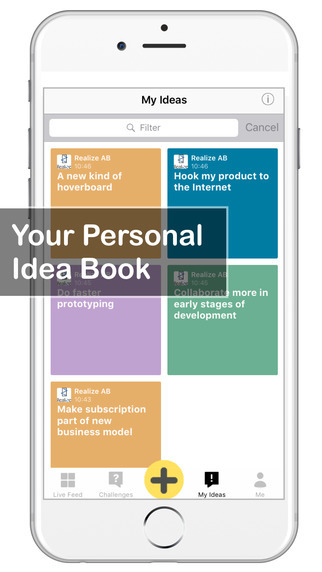 If you run out of the existing idea triggers, you can purchase more through the app. The main disadvantage of this app is that it is limited to the iOS application alone. The developers should include a feature to share your ideas with the whole world through social networks or other media. Besides this little shortcoming, the developers have taken a very simple concept and developed a simple yet effective solution that is highly functional and minimal. The app promises a set of features and executes them to perfection. It is a very unique productivity app and is worth exploring if you wish to share and grow your ideas. AppsTimes.in is happy to review your App. Fill out the simple form and our review team will check the application and review it and publish it. AppsTimes.in - is an Online Blog Magazine focusing on the Indian App Industry News, & Stories. AppsTimes also present helpful resources for App Developers & Startups. We also host an app review section. Check out and share your feedback. We are looking for useful content that is fresh and original, to publish. As you know, our target audience are App Developers, App users and App Industry Influence-rs. Your content should be related to App Industry, App marketing, App advertising, App promotion, App development, in some way.